Recalls his brother - who attended the game - turning him on to the sport. His older brother, who had given him his first pair of basketball sneakers when he dreamed of playing the game, was on hand at Madison Square Garden to see the Knicks host the Atlanta Hawks and to see Fizdale step onto the floor as the 29th coach of the franchise. 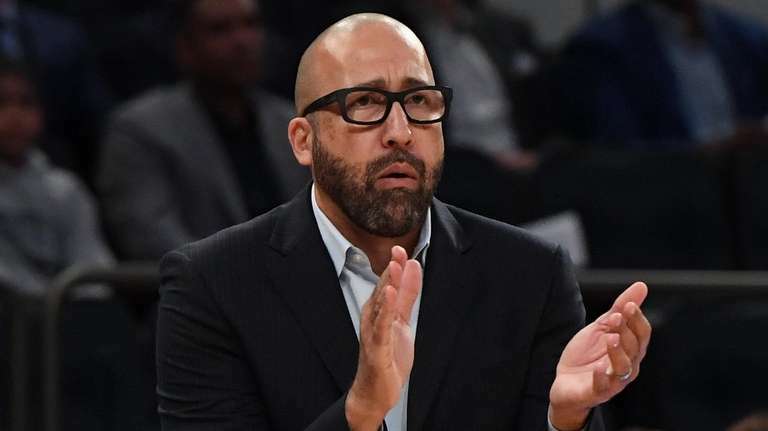 “The more people said it to me, I think that’s when it got to me,” Fizdale said before the game. “I went into work like a normal day and my guy Marcus had the music jamming in the hallway and we came in and did our normal prep and everything, but obviously probably first 10 seconds walking out there it hit me that I’m head coach of the Knicks at the Garden and my older brother is here and that’s a big deal for me. The nice thing about Day One in this role is that the introduction brings only cheers. That may not be the case as the losses mount during what is expected to be a tough season for the Knicks, a developmental project tasked to Fizdale. And despite the talk of patience, it might not last the night if the Knicks couldn’t beat the Hawks, another rebuilding project. He spent the preseason preaching the game plan of the organization, making the most of this roster while Kristaps Porzingis rehabilitates from a torn anterior cruciate ligament and teaching the game - and winning - to the likes of 19-year-old rookie Kevin Knox and 20-year-old’s Frank Ntilikina and Mitchell Robinson. That makes the job one that may be hard to judge. While Fizdale insists he plays to win every night, he admits that it’s not realistic to ask that of this group. “That’s a tough question,” Fizdale said. “The whole time I’ve said the last 12 to 14 years success was determined on how far you went. I don’t think that’s a fair gauge for this team. And I don’t know if I have the gauge because I don’t want to put a cap on them. This team may catch fire and figure some things out and may be a surprise or this team may go through some rollercoasters.